It's so difficult to start with a blank document, especially when it should have a standard format. Now you can use one of the 309 templates from the new Google Docs directory as a starting point for your timesheets, resumes, invoices, photo albums or party invitations. "A template gives you a quick start towards creating a document, spreadsheet, or presentation. Each template has boilerplate content and preset design styles that are meant to be reused. (...) You can then edit the document, replacing boilerplate text and images with your own," explains Google. The option to use a template is available in Google Docs when you click on New > From template and the list of templates that you've recently used can be found here. While Google doesn't explicitly offer an option to create your own templates, you can save them as regular documents and use File > Save as new copy (Copy spreadsheet) to create duplicates. If you publish a spreadsheet, append &newcopy to the URL to obtain a template link. I've really been waiting for a screenplay format template but since it doesn't (or appears not to) format as you type it's rather useless. I want something akin to Final Draft that is smart. The fact that I can't create my own templates is odd. These templates are a start. Next we need to be able to create our own. I'm sick of having to paste our group's image on each new page and the Save as new copy option isn't a clean solution. But they're getting there. It's only a matter of time. Are people with Apps accounts seeing them? There's a post from the Apps team saying they're going to be available but I don't have them :( This lag is very annoying, especially since we're a Premier customer. This is a great feature, I used to go to Microsoft to get the templates now we can get them at Google Docs itself. I hope users will add more templates with unique designs. This is a positive addition to the feature set. I look forward to being able to create my own templates. I ve several custom made Excel templates and I think now I can upload it and let google know about it. Very Nice! I'd love our company to use Google Docs, but that's not possible without our own templates (and fonts) . Better than Final Draft for me. can tell me, how to use this template? when can we create our own templates? I can't believe creating our own templates is not in this piece of crap software by now. 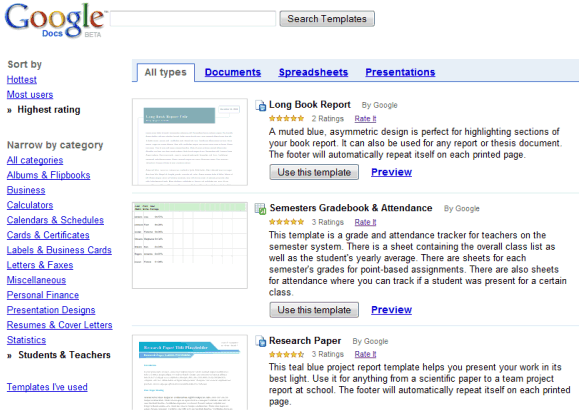 This is really a good idea by why not give the possibility too to use these template for google sites application?? I would like to set a default template to use for each of the document types. I would also like to be able to save and use my own templates. I was using one of the templates to create a resume, but I was unable to add an extra section. I tried copy-pasting from an existing section but it simply wouldnt align! Please let me know if there is a way to do it. Thanks! P.S: I was using the "circles" template to create my resume. I was extremely frustrated when I spent an hour inputting 59 scale questions in survey. I clicked on save and it started saving but never completed the action. I tried to email it and the same thing happened. In other words, I wasted an hour. Ouch! Nice feature, but it is not available in the norwegian layout.